General Homebrew Discussion / What is your favorite music to listen to while homebrewing? What kind of music inspires you to make a funky/tasty/interesting/delicious homebrew? General Homebrew Discussion / Now accepting nominations for '13 AHA Governing Committee Elections! Do you or a fellow homebrewer have an interest in helping shape the future of the American Homebrewers Association? In advance of the 2013 AHA Governing Committee elections, the AHA is looking for nominations for two of the committee's 15 seats. Pimp My System / Show us your Son of a Fermentation Chillers!! AHA Intern here. We are featuring Ken Schwartz's Son of a Fermentation Chiller design in an upcoming Pimp My System article, and Ken and I thought it would be a lot more interesting to showcase pictures of many different SoaFC as opposed to just one. So here is my request: post your Son of a Fermentation chamber pictures here and they will likely be featured in the Pimp My System article!! Thanks in advance for all those who choose to participate. If you don't want to post the picture to the forum, just let me know and you can email them to me! Pimp My System / Submit your Pimp My System nominations! Everyone knows Seattle—it’s the birthplace of grunge and Jimi Hendrix, the home of Starbucks, Microsoft, and Boeing, and a place full of sandal-wearing, latte-drinking, hi-tech, hippie freaks. Oh yeah, and rain. Yes, we have all of that and more, including a strong craft beer and brewing culture that is getting ready to celebrate its 30th year. The popularity of craft beer in the area is perhaps best illustrated by the fact that we have nine microbreweries—that is, nine microbreweries that start with the letter A. About 70 breweries are within an hour’s drive, and even the dive bars have a good selection of craft beer on tap. This year’s sold-out National Homebrewers Conference will be June 21-23 in the heart of downtown Bellevue, Wash., just across Lake Washington from Seattle. With the Hyatt Regency Bellevue as your home base, you can easily walk to a wide variety of breweries and bars. Wineries and shopping aren’t far away, and there are some great restaurants nearby. And by all means, come early! Featuring at least 64 breweries, the Washington Brewers Festival will be June 15-17 in Redmond’s Marymoor Park, about seven miles away. washbrewersIf you’re looking for a quick stop with a lot of variety, check out the Taphouse Grill just a couple of blocks from the conference hotel, featuring 160 beers on tap. Yes, 160. When you’re done sampling there, walk next door to Rock Bottom and taste one or all of brewmaster Brian Young’s award-winning creations. If you want to range further afield, walk a couple of blocks to the transit center and catch a bus to downtown Seattle, or go on one of our self-guided tours. Stop off at Pike Brewing—as long as you’re there, go to the Pike Place Market and see the world-famous flying fish and the original Starbucks store. Head up the hill to the McMenamins Six Arms on your way to the original Elysian Brewing location. Or you can make your way to the Ballard/Fremont area (Frelard) and visit Maritime Pacific, Hilliard’s, Northwest Peaks, Hale’s, and Fremont Brewing. Or go to the south end and hit Two Beers, Schooner Exact, Epic, Emerald City, and Georgetown Brewing. If you’re in the mood for some alcohol-that-is-not-beer, head 15 minutes up the highway to Woodinville where there are more than 50 wineries and tasting rooms. Or design your own distillery tour, with six distilleries in Seattle and four in Woodinville. Bringing the family? There’s a lot to do in the area, including visiting the Space Needle and Seattle Center, riding the monorail to downtown near Pike Place Market, and visiting the Science Fiction Museum and Experience Music Project. Come early or stay late to catch a baseball game at Safeco Field, or check out a Seattle Sounders FC match Wednesday night before the conference. Go to the zoo or aquarium, take a ferry to one of the islands, go hiking, kayak on the lakes, or just watch the sockeye in the fish ladders. If you can’t make it early enough to go to the Brewers Festival, hopefully you can take advantage of one of our pre-conference events. Conference organizers have set up eight brewery tours, a sold-out beer-pairing dinner, a beer-pairing breakfast, and a sold-out tour of the hop fields in Yakima. As you can see, attendance on the tours is limited, so sign up early! Brewery Tour A: 9:45 a.m.-4:30 p.m.
fish brewingThis tour begins by heading south to Tacoma where the first stop will be Fish Brewing. Fish is the maker of Fish Tale Organic Ales, Leavenworth Biers, and Spire Mountain Cider, and a line of highly anticipated high gravity seasonal beers. The next stop will be Harmon Brewing, an award-winning brewery that hopefully will have some Harmon Imperial Red (formerly known as Killer Brew) on tap. Food will be served. The final stop will be at newcomer Airways Brewing, just two years old but with a great reputation. Brewery Tour C: 12:45 p.m.-8 p.m.
Skookum Brewing is the first stop on Tour C. This beautiful brewery is set in the woods, making it feel like a rustic retreat. The people are friendly and beers such as Amber’s Hot Friend are top-notch. Next up is Chuckanut Brewing. This lager brewery is Will Kemper’s latest venture, and despite being open for only four years, they are already a two-time winner of the GABF Small Brewing Company of the Year. The final stop will be at Boundary Bay Brewing, brewer of many award-winning brews and voted the Best Brewpub in Washington state. Food will be served here. Brewery Tour F: 9:45 a.m. –3:15 p.m.
bigalbrewingFirst stop is Odin Brewing, a newer Seattle brewery where you can sample beers that range from a crisp Kölsch-style ale to a Belgian. The second stop is the Elliott Bay Brewing Company’s Burien location, where they brew a wide range of certified organic beers including everything from wit to imperial stout. Food will be served. The final stop is Big Al Brewing—Al (Alejandro Brown) is a local homebrewer gone pro, and he features a line of “local hero” beers made with homebrewers. Brewery Tour G: 12:45 p.m. – 6:00 p.m.
Brewery Tour G starts off with Naked City Brewing. A former homebrewer, owner/brewer Don Webb brews excellent beer on a 3-barrel system exclusively for the pub, supplementing the lineup with guest taps. Next up is Twelve Bar Brews, a new brewery that is producing some of the driest, crispest ales you’ll find but often with a big hop punch. The last stop will be Redhook Brewing, which has been brewing in the Seattle area for over 30 years. You’ve probably tried some of their nationally distributed beers, but they also make some great brews that are available only at the pub. This stop will also have food. Brewery Tour H: 12:45 p.m. – 6:00 p.m.
Tour H begins at Pyramid Alehouse, south of downtown Seattle and across from Safeco Field. Although many of their beers are well-known and widely available, the pub always has something new for the adventurous beer lover to try. Next stop is Schooner Exact Brewing—this brewery began in true nano-fashion and recently expanded into a bigger system to accommodate demand and feed its barrel program of excellent bourbon-aged and sour beers. The last stop is Epic Ales; known for an eclectic selection of beers to challenge any palate, their beers are designed to be paired with food. During the day, expect great talks for all homebrewing skill levels on a variety of topics. Learn more about new hop varieties (and taste beer made with them), water chemistry, mead, and even Soviet-era brewing. Get tips from pros in the Going Pro panel discussion, or learn how to organize a beer and food party from Chef Warren Peterson. We’re even bringing back the club organization panel that was so popular last year. Judging for the National Homebrew Competition will take place on Thursday. clubnightPro Brewers Night on Thursday will feature more than 40 breweries vying to serve you their beer, and Club Night on Friday will feature 50 clubs lining up the taps. Outrageous outfits, booth themes, and too many tasty beers to try in one night are the highlights of Club Night. The Awards Banquet on Saturday will feature the fabulous beer and food pairings of The Homebrew Chef, Sean Paxton, as attendees have come to expect. On Friday, Pike Brewing Co. founder Charles Finkel will be giving the keynote address. In between conference events, slake your thirst in the Exhibitor Hall where you can peruse the latest offerings from equipment manufacturers and vendors, get your questions answered directly by the experts, and sip on a tasty homebrew. And let’s not forget the hospitality suite, aka Sasquatch Social Club, where clubs will have their brews on tap for your tasting pleasure. With more than 1,800 homebrewers expected, it’s going to be a conference packed with fun, beer, and brewers. See you in Seattle! Tom Schmidlin, PhD, is co-chair of the 2012 National Homebrewers Conference and a member of the AHA Governing Committee. Elysian Brewing Company, Seattle, Wash.
To toast the malt, broil it for about 90 seconds at a time until it starts crackling a bit. Remove, stir, and repeat, making sure it doesn’t burn. Repeat four times. It should smell a bit like popcorn at the end. Steep and muddle mint (if using) in hot (not quite boiling) water; add to mash. Infusion mash at 154° F (68° C) for 60 minutes. Sparge with 165° F (74 ° C) and collect enough to yield 5 gallons after a 90 minute boil. Stir honey in at beginning of boil. Chill, add cider, and pitch yeast. Extract Version: Substitute 8 lb (3.63 kg) pale malt extract syrup for pale malt. Steep toasted malt in 150° F (66°C) water for 45 minutes. Rinse grains, add extract and honey, dissolving completely, and proceed with boil. Mash in at 120° F (49° C) for 30 minutes, ramp to 153° F (67° C) and hold for 30 minutes. Sparge with 165° F (74° C) water to collect 7 gallons (26.5 L) of wort and boil. Ferment at 67° F (19° C) for 4 days. Add dry hops, hold at 67° F (19° C) until fermentation is complete. Carbonate to 2.5 volumes of CO2. Mini-Mash Version: Substitute 9.25 lb (4.2 kg) pale malt extract for the 12.3 lb (5.6 kg) pale malt. Mash rye, Munich, crystal, and melanoidin malts at 155° F (68° C) for one hour. Rinse grains, completely dissolve extract, and proceed with boil. Single infusion mash at 153° F (67° C) for 60 minutes. Ferment at 65° F (18° C) until finished. General Homebrew Discussion / Smoked Blueberry Tea Bier: Too crazy or insightfully brilliant? My mash schedule was hectic to say the least. The temperature was fluctuating between 145 and 160 constantly for 90 minutes. Estimated OG was supposed to be 1.055. Measured gravity was 1.035 at the end. I believe the efficiency was something like 50%. So here's what I did. I had a few beers and got creative, and decided to add 2 lbs of cane sugar to bump the gravity up to where it was supposed to be. Then I saw 2 lbs of blueberries in my fridge and decided to boil those up and throw them in too. Then I saw some ginger peach black tea bags and tossed two of those in there. Oh yea. What do y'all think? Is this beer going to be drinkable? Did i get drunk and do too much crazy stuff? Is it ruined because I didn't mash efficiently? I brewed yesterday and it's bubbling away healthy now, I used a good starter of German Ale yeast, so at least fermentation will be good. Thoughts? It’s time once again for Zymurgy’s Best Commercial Beers in America Survey! As homebrewers and beer lovers, Zymurgy readers have the most educated and adventurous palates on the planet. So for the 10th year, we are asking you, "Who brews the best commercial beers in the land?" Five lucky voters, chosen at random, will win an AHA prize package! 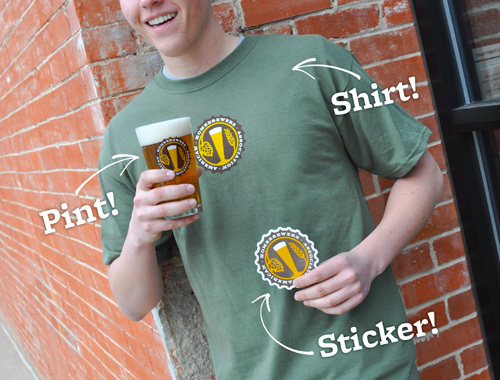 The package includes the new AHA logo t-shirt, a pint glass and a logo sticker. Please have your AHA member number handy before voting. Submit up to 20 of your favorite domestic and imported beers; they must be commercially available in the United States. Only one voting form is allowed per member. While voting, take a minute to review one of your top beers, in 150 words or fewer, and include that in the "Comments" field (this is appreciated but not mandatory.) We'll include some of your comments in the July/August issue as well as in the "You've Gotta Drink This" in future installments of Beeroscope. Voting ends March 16, 2012. Tabulated results are presented, along with clone recipes for some of the top beers, in the July/August issue of Zymurgy. The American Homebrewers Association (AHA) is constantly adding new breweries, brewpubs and restaurants to the Pub Discount Program. Participants offer discounts to AHA members in recognition of the passion homebrewers have for beer and craft beer culture. This proved especially true in 2011 with 133 new locations added to the Pub Discount Program. Now, AHA members can enjoy discounts at over 600 participating locations across the United States and Canada. Discounts range from 10% off beer, food and merchandise to Happy Hour Pricing All Day. Some even offer a free gift! So grab a friend, a family member or bring the whole homebrew club by for a beer, and let them know you appreciate their support. Check out the most current Pub Discount Program list and visit it each time you head out for a beer, take a trip or plan your next vacation. Great beers await you around every corner! The moment you've been waiting for is near! Registration for the 2012 AHA National Homebrewers Conference opens Wednesday, February 1, 2012 at 10 am MT. Get your registration in soon. This conference will likely sell out quickly! For more information about the upcoming conference, visit www.AHAconference.org. At 10am MT we'll release more information about the official conference hotel, access to room reservations at the AHA's discounted rate and, of course, AHA Conference registration. Events / Let's Go Clubbing! Were you planning on drinking that entire five-gallon batch of Wee Heavy yourself? Wait. Don't answer that. The bottom line is that it's better to share, trade and exchange beer with your fellow homebrewers. That's what makes homebrew clubs so much fun! Chances are, there's a crew of like-minded folks who have already formed a club in your town or area. Not convinced? Well, take a trip over to our online club finder to see what's going on in your neighborhood. You can search by either state or keyword to find the right crew for you. Looking for more? We've got everything from resources to help your club thrive to details on Club-Only Competitions, and stories about other clubs. If you're still jealously hoarding that stash of Dunkelweizen, consider this: sharing your homebrew with a crew of friends is scientifically proven to make the beer taste better. Well, either that, or you'll just pick up some great tips and tricks from the rest of the folks in the club. Saturday, Dec. 10 at 11 AM, Wynkoop Brewing Company is releasing a specal beer made in conjunction with the American Homebrewers Association (AHA). Wynkoop is Colorado's first brewpub and founded by CO Governor John Hickenlooper. The beer -- Collective Hoppiness -- is a unique continuously hopped beer Wynkoop brewed during the American Homebrewers Association membership rally that Wynkoop hosted on November 12, 2012. The beer's hop additions were carried out over a 90-minute period by local members of the AHA, and 210 members participated in the hopping of the beer. wynkoop2Wynkoop describes the beer as "an unctuous imperial red ale made with premium two-row base malt, small amounts of rye, aromatic malts and flaked oats, and five kinds of hops (Summit, Cascade Sorachi Ace, Amarillo and Columbus). All fermented with an English ale yeast. Ultra hoppy from start to finish, the beer finished at 8% ABV and has approximately 100 IBUs." AHA members who buy the beer and flash their membership card receive a complimentary, limited-edition Wynkoop & AHA logoed pint glass with their purchase of the beer. "Hosting local members of the AHA," says Wynkoop's Marty Jones, "that's welcoming our dream audience. These are people that love small-batch beer as much as we do, they are as beer-passionate as we are." "Plus," Jones adds, "we owe our start down the road of craft beer to the AHA. We're disciples of Charlie Papazian. We learned to brew reading his books and Zymurgy. For many of us, in our early beer-discovery days the only way to get full-flavored beer was to make it yourself. So hosting the AHA membership rally allowed us to repay a debt and say 'thanks' to an organization that we treasure." General Homebrew Discussion / Happy Birthday AHA! Today we have a very special birthday, guess who? It's us! Happy Birthday American Homebrewers Association! It's our thirty-third birthday today, no presents necessary! Instead, just raise a pint of homebrew and cheers to thirty-three years of the great art of homebrewing! Feel free to make a toast too of course if you're the eloquent type. Check out the Cigar City Brewery. An opportunity to mingle with local homebrewers. Chance to win great prizes from the AHA and Cigar City! The AHA has posted a new story about the the History of Homebrewing!